It’s my birthday, and while I have always said I was young at heart—the key to never feeling older—I realized I needed to honor the wisdom I’ve acquired along the years. This morning I rose after sunrise and headed to one of my favorite places right now in my life. The marsh. The sun was already warm and turning the river to liquid gold in places. A tree beckoned me to climb it and simply lay against her enormously curved branch, and I looked up at the turquoise sky. It was beautiful and playful and restful. Exactly what I needed. A person ventured toward my private space, so I moved on. When I came to the ring of stones facing the water, I stood on one and thanked the divine for all that had come before, all that is, and all that will be. Then I did a little yoga and Qigon with the sunlight streaming over me like a blessing and resumed my walk. There was magic everywhere. The fish even seemed to be dancing, leaping out in the water as if responding to a conductor’s cue. I allowed the morning quiet to settle inside me. The story I am currently writing flowed in and out of my mind with new inspiration, and I watched it, and then let it go. By the time I left the marsh, I was completely at peace and so happy to be here, celebrating another glorious year. From there, I went to my favorite French café to have some bubbly, a pan de chocolat, and quiche. 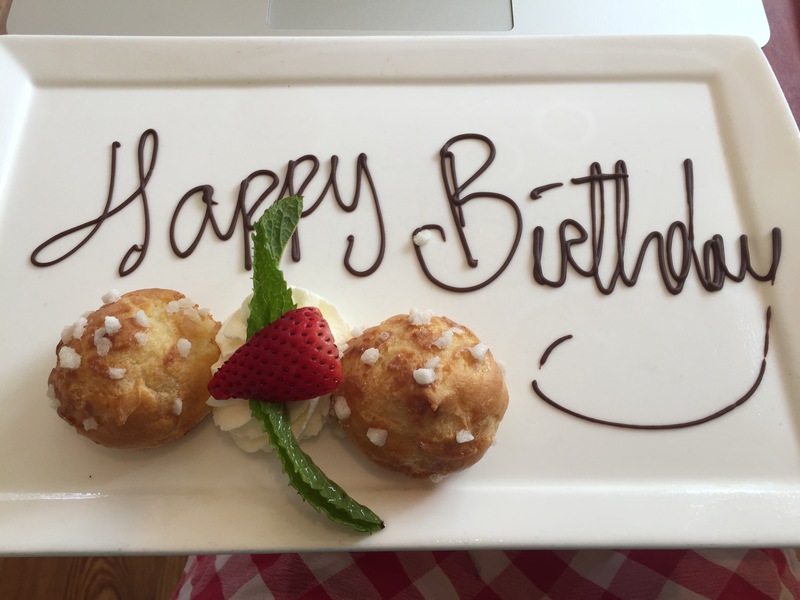 They know me there, and pretty soon, one of the waiters brought me a plate of chouquettes (these marvelous French cream puffs) with Happy Birthday written in chocolate. Wonderful! Then it was off to buy more pink champagne for my birthday party tonight since my friend wouldn’t let me bring a single dish—a rarity for this former chef. For me, birthdays are a time of beautiful reflection, gratitude, celebration, and dreaming. What might this new birth year bring? So much is happening. Magical things. Wonderful things. I am left speechless and breathless sometimes. Other moments, I simply laugh and put my hands to my heart and bow to all there is supporting me in fine fashion. What would life be like if we lived like this every day? I’ve decided today I’m going to try it and find out. That sounds like an absolutely MARVELOUS birthday! 🙂 May you have many, many more.